While researching landscapes for the blockbuster movie Avatar, Hollywood special effects wizard Eric Hanson visited the Zhangjiajie Scenic Area in Hunan Province to collect images of its spectacular mountains. 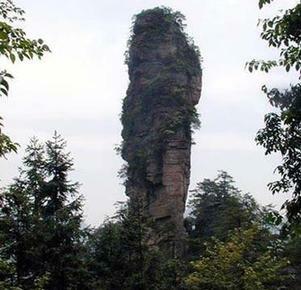 Hanson’s photos, some of which he mailed back to a digital media research center in Hunan University, confirm that the “Southern Sky Column” mountain is the prototype for Hallelujah mountain sacred to the Na’vi people in the movie. Officials hope that Zhangjiajie, just an hour away from the prosperous city of Guangzhou (Canton) by high-speed rail, will be able to cash in on its new-found fame. 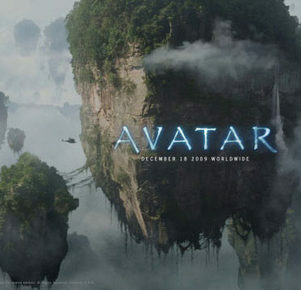 Sun Yan, manager of the local branch of China International Travel Service, says that since they started to offer Avatar-themed tours, countless individual and group travellers have visited the area. Zhangjiajie’s unique quartz sandstone landscape was formed 380 million years ago. It first came to the attention of the Chinese public after the painter Wu Guanzhong recorded his impressions of the area in a 1980 essay Deep in the Chamber. Twenty years later, Avatar launched Zhangjiajie onto the international stage. The most spectacular area of Zhangjiajie is Yuanjiajie in the Wulingyuan Scenic Area. Take the Huangshizhai (Yellow Stone Village) cable car to a mountain-top platform overlooking a 1,000 meter vertical drop to the valley beneath. A spectacular view awaits those brave enough to peak over the edge. From nearby Liuqi Pavilion you have a panoramic view of the entire park: to the east is Tianzi (Son of Heaven) Mountain; to the west are Chaotianguan (Heavenward Taoist Temple), Longfeng’an (Dragon and Phoenix Nunnery), Yuhuanggong (Supreme Heavenly Emperor’s Hall) and Qipanta (the Chessboard Pagoda); to the north you can see Heizongnao Virgin Forest, while to the south is a view of Zhanjiajie City. A two-minute cable car trip takes you to the idyllic Jingbianxi valley. Dozens of Tujia ethnic minority families live on the valley floor which is criss-crossed by crystal clear streams. If you are lucky you may catch a glimpse of a giant salamander. Climate: Zhangjiajie has a subtropical monsoon climate with abundant rainfall and sunshine. Winters are short and the average annual temperature is around 16 degrees Celsius but bear in mind that temperatures at the top of the mountains will be 3-4 degrees lower. Accommodation: In the Wulingyuan Scenic Area, the Wulingyuan International Resort, the Qinghe Grand Hotel, and the Wulingyuan Hotel offer top-class accommodation. If you prefer to stay in the city, the Zhangjiajie International Hotel, the Jindu Hotel, and the China Southern Fulilai Hotel are good options. Food: The spicy cuisine of Tujia Ethnic Minority is another reason for visiting Zhangjiajie. Tujia people are also famous for their wind-dried delicacies. The Yuanjia Village restaurant in Yuanjiajie is a good option for sampling the local cuisine. Shopping: Local produce include green tea, kiwi fruit and bean curd. Handicrafts including brocades and batik are good buys. This entry was posted in Travel and tagged Avatar, Zhangjiajie. Bookmark the permalink.